Norma Jean are one of those bands who’ve been consistently excellent throughout their career, with each release bettering the one preceding it. ‘Wrongdoers’ continues this trend in exceptional fashion, and is, in my opinion, the bands best release, and one of the best metal albums you’re likely to hear this year. Over the past eleven years Norma Jean have honed their craft brilliantly, and their sixth studio album is truly phenomenal as a result. ‘Wrongdoers’ is a thundering record, which rarely lets up in its sensual assault, bar weak filler track ‘Afterhour Animals’ and the sprawling closing track. It demands your full attention (and holds it) as a means to truly run its listener into the ground. Rarely has metal-core been so well delivered, as ‘Wrongdoers’ is expertly crafted and arranged in a way that guarantees maximum impact. The main breather comes at the mid-point and the five tracks that lie on either side of it are relentless and exhilarating. Each song brings something new and heavy hitting in its delivery, via exceptional vocals or crushing instrumentals. Every aspect of the album shines, and comes together brilliantly, making for a diverse and layered experience, unlike any you’re likely to hear this year. Songs such as ‘The Lash Whistled Like A Singing Wind’ and ‘If You Got It At Five, You Got It At Fifty’ are explosive, being more traditional metal, with excellent riffs and venomous drumming. Instrumental work on the album is particularly good, with drums and guitars working together to deliver a truly ferocious sound, most notably on ‘The Potter Has No Hands’ were the two sounds merge together seamlessly. The chemistry between every contributing factor is clear, and shows that despite numerous personnel changes Norma Jean can work as a single unit capable of playing gut-wrenching and passionate music. The bands ability is most apparent on the records title track, which is my eyes is the records best, if not one of the best in the bands discography. 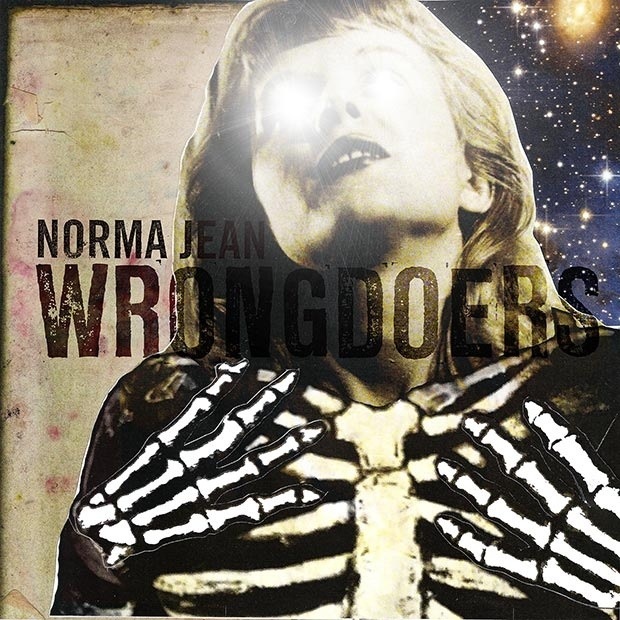 ‘Wrongdoers (song)’ showcases everything good about Norma Jean, and is the band at their stunning best, being varied in delivery, mixing a range of techniques, and having an excellent chorus. Closer ‘Sun Dies, Blood Moon’ is an expansive 13 minute masterpiece, ending the album in remarkable fashion. It offers the only real bit of down time, bringing in violins, and shimmering soundscapes, again showcasing the bands ability to write structured and textured works of art. Each track excels, and by having some fade into the following song it creates a seamless experience, as a means to truly engage and capture its audience. Opener ‘Hive Minds’ features a sublime bass line in the middle, and as a whole sets a very high standard for the ten tracks that follow. The tracks final minute is one of the albums best, and the riffs it contains are staggering, before the track drops off as suddenly as it climaxed. The bands ability to shift from complete chaos to controlled and structured moments of serenity is displayed on ‘Funeral Singer’ which conveys emotion in a way that few artists can, and many dream of doing. Cory Brandan Putman’s mixed and emotive vocal delivery shines on ‘Wrongdoers’, be it through soaring choruses or intense verses. ‘Sword In Mouth, Fire Eyes’ lacks any aggressive vocals and is a great display or versatility, whilst other songs on the album are solely vocally raw and savage. Lyrics are solid and well written, but definitely take a back seat to the chaos sound tracking them. Ultimately, ‘Wrongdoers’ is the sound of a band at their musical peak, with the album reaching incredible highs and crushing lows. It rarely relents in its assault, and makes for a truly enthralling listen, that demands attention. There wasn’t a second of this album during which I wasn’t blown away, and I can’t praise it enough. It’s simply incredible, and miles ahead of any other metal release this year, further asserting the bands position as one of the best. You thought ‘Meridional’ was good? You haven’t heard anything yet.